A traveling minister and his disciples in North Carolina have been accused of using child slavery to fund their “alternative religious group” and its operations for years, authorities say. Police in North Carolina have arrested four people—and have open warrants on six more—in a case of suspected child slavery. According to multiple outlets, an “alternative religious group” in Cumberland County, N.C., has been forcing children as young as 9 to work full time at the group’s fish markets to help fund the organization’s operations. The children were residents of the McCollum Ranch, a communal property owned and operated by John C. McCollum, a minister. He also ran four separate “John C’s Fish Markets” and mobile grills around Fayetteville and Lumberton in North Carolina. The Fayetteville Observer reports that McCollum referred to himself as the “chief apostle” at the ranch, and authorities allege that McCollum would threaten the children with physical violence or deny them food if they refused to work. The children had to work full time in the fish markets with little to no compensation. The children are performing labor such as lifting heavy boxes/shipments (reportedly some weighing approximately 50 lbs), keeping fish iced, cutting fish and cleaning; additionally, many of the children were performing construction and maintenance on the mobile grills after fish market hours. The former residents also informed investigators that the children were not attending school and were being denied adequate education and care. Police have been investigating the ranch since last year after a 15-year-old boy escaped from the compound in March, the News and Observer reports. 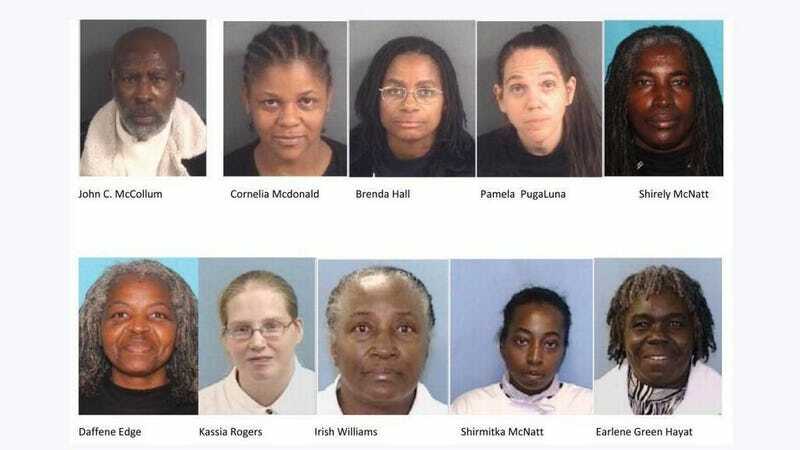 Several of the children’s mothers were managers at the fish markets, and authorities say they believe that some of the children may be second-generation victims of McCollum. Lt. Sean Swain, a public information officer for the Cumberland County Sheriff’s Office, says that the department has investigated McCollum at least four times before. McCollum has also pleaded guilty to misdemeanor child abuse before: In 1990, McCollum was charged with beating children with an automotive fan so badly that it left scars. WRAL-TV and other outlets also report that McCollum was a traveling minister, hosting tent revivals throughout North Carolina and other states. Police believe it was through those tent revivals that McCollum, who has been preaching since the ’80s, recruited people to live on his ranch. Police have so far found 120 people, not including children, who lived at the ranch over the years. As of Wednesday, McCollum was still at the Cumberland County Jail, being held on $1.1. million bond.